To Sleep, Perchance To – Oh, The Hell With It, I Just Want To Sleep! Kage Baker always viewed my insomnia with both sympathy and suspicion. She could see that going sleepless sometimes quite drained me, and she was sorry for me about it. But she could also see that just as often, I enjoyed being awake for days at a time: I’d get a second wind, and just keep going like an infernal wind-up toy. She always harboured a slight suspicion, therefore, that I was sometimes faking it. Ah, so much for the careless pride of our youth! Once a charter member of the Sleep Is For Sissies Club at Faire; able to stay awake for days at a time, the only member of the party who could leave Novato at 7 PM and drive the entire distance to Los Angeles – I am now a victim of a deranged sort of narcolepsy. Can you have narcolepsy combined with insomnia? Because that’s what I’ve got. I either cannot sleep at all or I cannot stay awake for love, life nor money. At least, I don’t think so. No one’s offered me money, but I will go on record as being willing to try it if someone does. I should see if the MacArthur Foundation gives grants to bats. What this does to creative work is disastrous. If I just slept all day and worked all night, I could do it. (I know I can – I’ve done it for years.) It’s the fragmented, 24-hour cycle of NEVER getting enough sleep that is eating my brain. I’ve seen poor Kage bent over her keyboard trying to write through a fog of fatigue many times; argued her to bed, and listened to her wails of horror at the drivel she found she’d written the next day. But her sleep would always kindly return and fold her in sweetly crepuscular arms, and normality would resume. Not me, man. I’ve taken to staying awake until the paragraph I am writing (or reading) no longer makes sense; then, as my Boca’s area goes flat line, I know I might be able to sleep. But it’s never enough, and when I sit down a few hours later to try and write, I find I’d do better using a Ouija board in Sanskrit. Last night, though, I took a decisive step in solving this problem: I reported to a nice cozy surrogate bedroom in Encino, for an all night Sleep Test. The room was lovely – big, soft bed, diverse relaxing aids like salt lights and perfumed candles. I’ve spent entire conventions in worse rooms. Mind you, I was wired head to toe like an astronaut headed for the moon – they skipped the thermometer up the bum, but made up for it by gluing a dozen electrodes to my scalp with Silly Putty. Wires snaked up my pajama sleeves and down my pajama legs, and the whole kit and caboodle met at the nape of my neck in a braid of thickly twined cables held together with a pink hair scrunchie. I looked like the Predator guest-starring in Good Night, Moon. Nonetheless, I managed to fall asleep (I had prepared by not giving in to the urge all the day and night before). Halfway through, the nice technician woke me up to spend the rest of the night on a CPAP nasal mask: not too bad, as they are smaller now, but if I had to wear one every night, I would be forced to decorate it like Bane’s Mask – maybe with a crocheted cover, like this one: I discovered, while wearing this, that if you open your mouth and relax your epiglottis, the pressured air from the mask rushes out of your mouth like a dragon’s breath. You can make very weird noises like this. It’s clearly not helpful for the test, as the tech politely asked me stop it; but it was amusing for a while. Despite all the fun and discomfort of being in a strange bed wired up like the Space Shuttle, I managed to sleep enough to serve the purposes of the routine. At 5:30 they woke me up and sent me on my way, driving through the pearly dawn down the 101 to home. My doctor will contact me with the results, eventually. What will they be? Will I have to take Remedial Sleeping? Will I have to be re-classified as nocturnal? Will I spend the rest of my nights in a steam punk burka, breathing like a soprano Darth Vader? Stay tuned, Dear Readers, for the ongoing absurdities. It feels a little like I’m caught in one of those goofy stories Kage wrote so well … but you know what? If I get some sleep out of this, I just won’t care. 14 Responses to To Sleep, Perchance To – Oh, The Hell With It, I Just Want To Sleep! You had a nicer room than I did. The bed was comfortable for my apnea test, but it looked like a lab. Sadly, it didn’t have any Jacob’s Ladders. Oooh, a Jacob’s Ladder would be neat! I had a definitely girly room, really – pinks and pale browns, candles, soft light, an overstuffed armchair. All the electronic stuff was concealed or camouflaged. I should have brought a stuffed animal. I’m a little jealous. I had to go home with borrowed equipment and bring it back the next week. They farmed the computer chip out of it and two weeks later they told me I didn’t sleep well. I’d love to have the illustrated crocheted cover for my mask but I’m afraid I’d scare Rory to death one night. Best wishes on your test. I hope they can help you sleep like a normal (for Faire) person. Oh, Lynn – Rory’s been waking up at various Faires for most of his life! 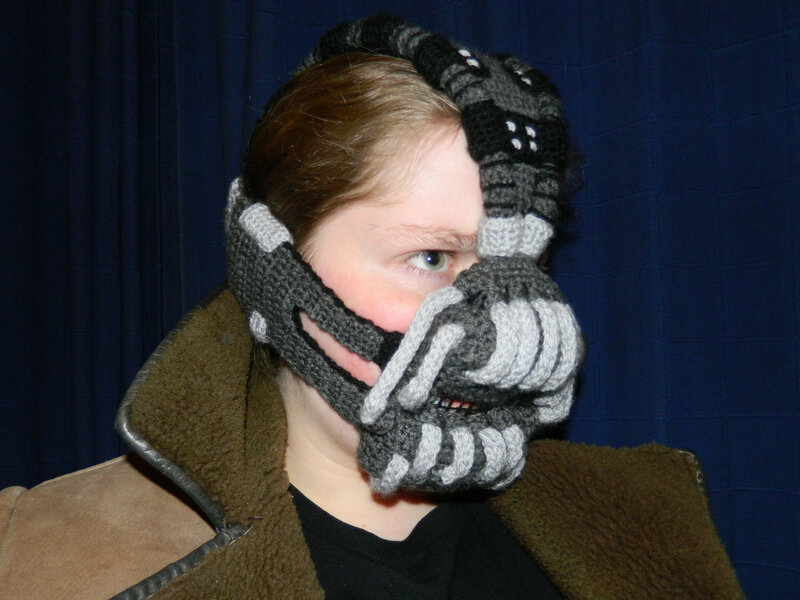 A nicely crocheted Bane mask can’t be any worse! I’ve only found the photo so far, but I’m going to search for the pattern, because I suspect I’ll need a CPAP and I want the Bane mask. If I find it, I’ll make you one! My doctor, bless him, specified an on-site, observed test. He said we already knew I wasn’t sleeping, what he wants to know is WHY and HOW BADLY. I can only hope your experience is as successful as mine, Kate. I was diagnosed, ump years ago, with severe obstructive sleep apnea, and prescribed a CPAP- and it truly changed my life. The chronic dysthymia, the exhaustion and involuntary naps, all that, gone. I won’t go into the effect that chronic sleep deprivation has on both mental and physical health, because you already know about it, avid researcher that you are. Just saying that it can be a life-changer, and I hope it is for you! Oh, me too, Buffalo! Even a diminuation of this would be an improvement. It’s been frustrating, being unable to find a DIY solution. I’m looking forward to solving this, preferably before I fall asleep at a traffic light. Funny you should say that, Kate. That’s exactly what got me to finally decide to get the sleep test that my friends and DJ had been after me to do, for a couple of years. I stopped for a red light, just a few blocks from here, and fell dead asleep. No warning, just- boom- asleep. For a long time, I’d been having trouble staying awake while I was driving, especially on the freeway, but this was the last straw. Haven’t had any such problems, since I started using the CPAP, and I’m really grateful. I was dangerous, out there. Fortunately, I have yet to fall asleep while driving. But that is partly due to my refusal to drive when I am feeling especially exhausted from this dippy sleep cycle. It’s a particular fear of mine. I realize there is only so careful I can be, before I either give up driving or become a menace on the road. And I will not give up driving! Not yet. My reflexes and eyesight are fine, and 60 is not that old: but I need to be practical and fix this sleeping problem. Even the few hours I spent on the CPAP last night made it very obvious that the quality of my sleep can be improved. I would really like that! So, I’m curious. Do salt lamps really do anything other than look pretty? From what “Dr.” Mercola says on his website, they’re the greatest invention since the wheel. Salt miners are allegedly so happy with mining salt all day that they’d probably pay to work there! (In direct contradiction to the phrase “Back to the salt mines.”) Plus. Himalayan pink salt is magic and cures all ills! You can almost hear the tinny carnival music in the background and smell the popcorn as the good doctor touts his marvelous wares. Salt lamps sound even better than the Hutzler 571. I have no idea if salt lamps do anything – I think the idea behind them is that they release ionized particles, like ozone, that do miraculous things to you … the one in my room was pink, too, although whether it was Himalayan, dyed salt or carefully wrought plastic is beyond me, It gave off a very pretty roseate light, but it was awfully … Disney princess-y. You know? Of course, you know me, I did not read CPAP but CRAP and thought, “What the…?” I still saw the modified word when I read through the comments. 😉 Yeah. I don’t need a CPAP device, I need a new brain. I hope your adventure as a lab rat proves productive. If not, will you join me in taking over the world? Narf! Much like Buffalo, I was falling asleep at the wheel. Terrifying. The VA gave me a cpap machine and sent me home for testing. When they pulled the memory chip, it seems I was waking up about 250 times a night, thus never getting real sleep. Once I had my own CPAP life was wonderful again. I could focus on something more enervating than Solitaire. Good luck with your search for sleep, Kathleen. Hey, Becky – I typed CRAP a few times, I assure you. I think I caught them all, but you can’t be blamed for misreading it. One thing I did learn: I did sleep better with the thing on. The four hours sleep I got with the wind blowing up my nose gave me more rest than the four hours without – so the preliminary analysis (mine alone and purely anecdotal) is that it works. Which means that soon, soon, my magnificent brain will once again be operated at maximum power, and we can, yes – dare I say it? – take over the world! Michael, everyone I know has been assuring me that a CPAP will indeed work to give me better rest. Since I spent 4 hours on one Monday night, I agree. I will have no objections to using one. Besides, the games one can play with air channels and one’s epiglottis were fascinating … and let’s face it, how often can you play any games at all with your epiglottis?